Carlo Mattogno, Jürgen Graf: Treblinka—Extermination Camp or Transit Camp? Holocaust survivors report that at least 700,000, and perhaps as many as three million, people primarily of Jewish faith were murdered in the Treblinka camp, located in eastern Poland, between the summers of 1942 and 1943. Various murder weapons are claimed to have been used: mobile or stationary gas chambers; quicklime; hot steam; high voltage electricity; machine guns; vacuum chambers; chlorine gas; Zyklon B; and diesel exhaust gas. According to the witnesses, the corpses of the victims were finally incinerated on pyres as high as a multi-story building without leaving any traces. In the first part of Treblinka, the official account of the camp is subjected to a thorough critique of its historical genesis, inner logic, and technical feasibility. Mattogno and Graf's analysis reveals that the historical picture prescribed by penal law in many European countries is nothing more than an unbroken chain of absurdities. 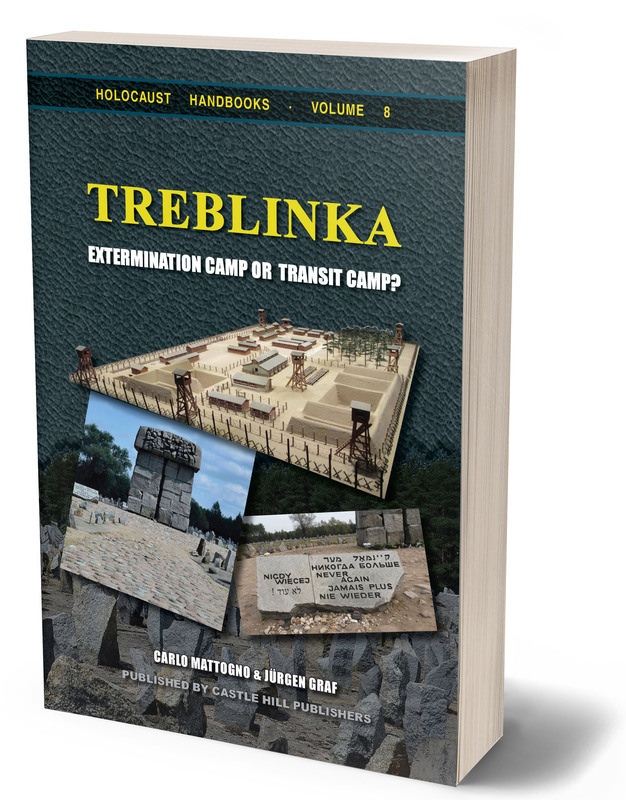 In the second part of Treblinka: Extermination Camp or Transit Camp? 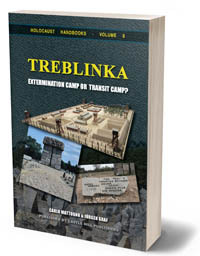 the authors attempt to determine the real function of the Treblinka camp with the help of witness statements, documents, and forensic findings. Through their analysis, they conclude that Treblinka was a transit camp, through which Jews from Warsaw and other areas were led on their way either to occupied Soviet territories in the east or to the Majdanek camp and other labor camps in the area south of Treblinka. Even longtime revisionism buffs will find a lot that is new in this book, while Graf's animated style guarantees a pleasant reading experience. The original testimony of witnesses enlivens the reader, as does the skill with which the authors expose the absurdities of Holocaust historiography. reprint of 2nd, revised edition, 372 pages. Format: pb, 6"×9", 35 illustrations, bibliography, index.